Elaborate bars have been commonplace in the homes of the elite for centuries, a traditional method to display wealth in the nature of libraries, ballrooms, and great foyers. 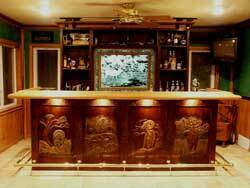 A bar is not defined simply by the service of alcohol; they are a social center within a home. 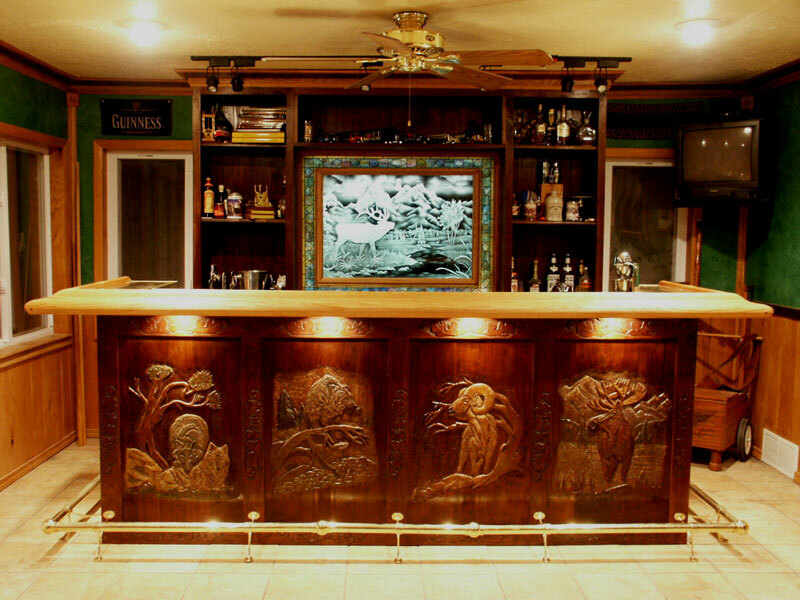 Whether stand behind, service bars, or fully configured with elaborate canopies, Artisans offers a wide array of period bar units, custom built to fit within a home's dcor. Available in high-grade plywood, or solid wood, bar units are a welcome addition to any home. 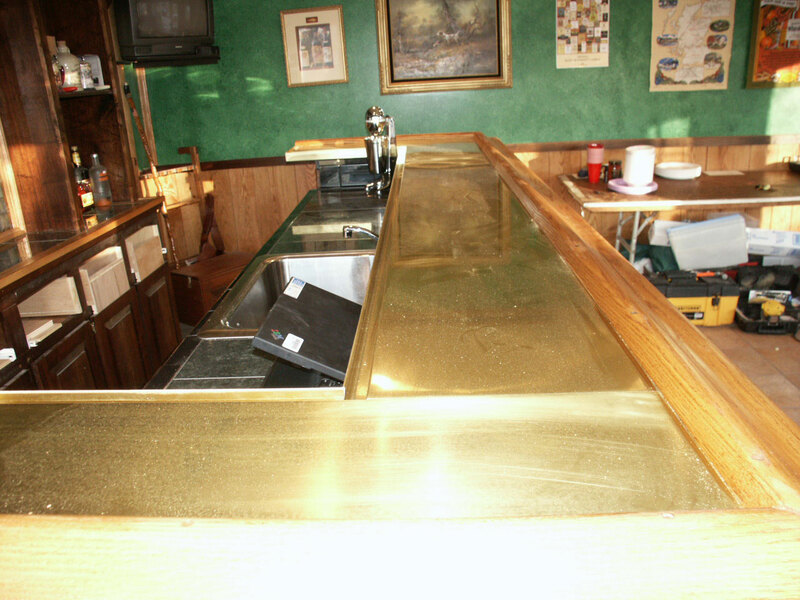 The feature bar of our site is a work in progress in Eric's home. We use our homes as our showrooms and are always tinkering with projects. Stanley and Cindy's home features our period furniture, while Eric's lends more towards the custom built-in style. This section is designed to feature Eric's ongoing project, and will be updated as often as possible. Eric's nine-foot long walnut bar unit will consist of two main sections. The rear section is a floor to ceiling breakfront service unit including storage cabinets, drawers, and shelving. The forward bar section, still in the shop, will consist of a six flat panels four to the front, wrapped and deep set in a 6/4 walnut frame. Sections of the frame are detailed with a simple oak leaf and acorn design while every panel is hand carved with a unique perspective design. The panel's design includes perpendicular grain 4/4 solid walnut laminations assuring stability while allowing over 3/8" relief carving. Hidden attention to details such as this, ensure our work will last generations. NOTE: Professional pictures are coming soon, we've had so many requests to see the progress that we posted these snapshots in the interim! We'll have Tom (our photographer) take the final shots when the project is finished. The bar sits in a remodeled addition to Eric's home, including solid oak wainscoting, oak trim, and crown moldings. The final floor plan includes custom ornately carved poker table, and oversized fish tank with an oak stand of Eric's design. The goal, along side the obvious desire for a bar, was to extend Eric's skill set beyond just mortis and tenon and panel construction into the realm of perspective scene carving and medium depth relief. Check Page Three of the Bar Section for Details! 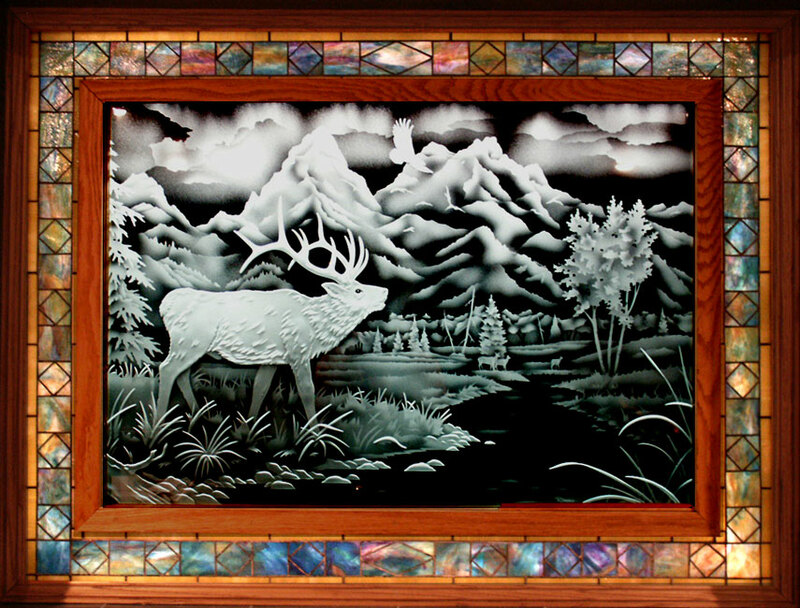 The room's crown jewel and the birthplace of the wildlife theme, is a hand etched and edge lit Starfire glass wilderness scene with a colorful stained glass frame subtlety backlit to display a contrast in materials and adding an extra artistic feel to the completed unit. Over a year from conception to completion, the etching is an original piece by Artist Randy Mardrus of Permanent Reflections, and the glass framing the work of Stained Glass Artist Robert Saperstein, Stanley's brother. The glasswork is featured and described in detail on page three of the bar section. 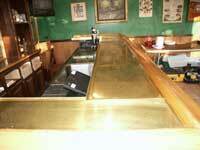 Counter surfaces will be hunter green marble tile, with a brass bar surface trimmed in oak. The forward unit contains a sink, dishwasher, refrigerator, & icemaker. We are always happy to work with your tile specialists, electricians, plumbers, and other craftsman to complete a fully functional project. Please note: If your project is commercial, we affiliate with several nearby cabinet shops specializing in larger scale projects for the production side, providing our skills for detailed carving and design.